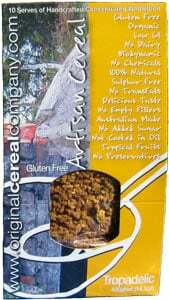 Original Cereal Company Pty, Ltd. Influenced by the principles of Traditional chinese (TCM) and Indian medicine (ayurveda),Tropadelic Artisan Cereal is nourishing yet cool to the body. It is sweetened with a combination of dried coconut nectar and rice malt. Coconut nectar is the unrefined syrup which flows from the coconut palm. It is simply dehydrated on the village level, and is a mix of complex natural sugars, vitamins, minerals, trace elements.and the cool essence of the palm tree. Our rice syrup is naturally malted brown rice. These are then combined with the nourishing protein rich nuts and seeds common to warm climates, also rich in the right sorts of omega fatty acids. Our organic virgin coconut oil is vital in the synergy with coconut nectar to relax and revive. Lotus seeds are our catalyst. Born of the water, they are cool and tonic, traditionally used to delight and a native food of northern Australia. Then the mix is infused with the aromatic fruits of the rainforest…naturally dried mango, banana, papaya, scented pineapple and the cool nutrient dense sweet from the hot deserts...dates . Harmony comes from the vanilla orchid.